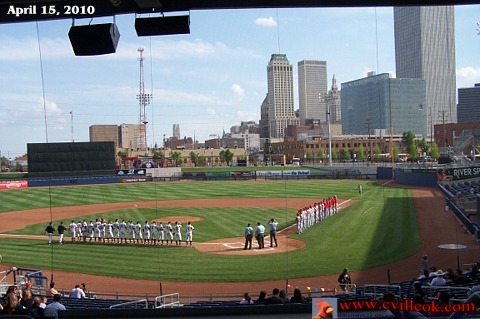 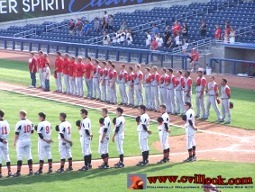 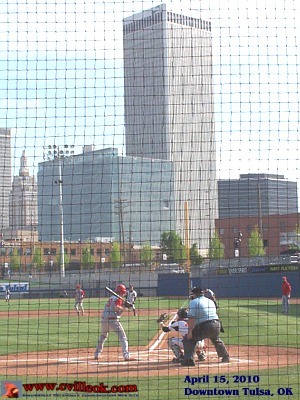 12 HS teams played at the Tulsa Driller's brand new field this week. 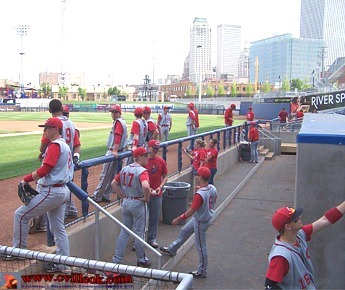 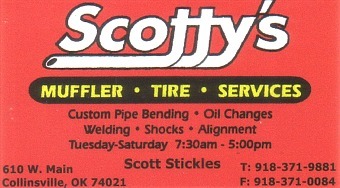 Nick Goza warmed up his pitching arm in the OneOK bullpen, then moved to the mound and after the very first Sperry batter barely sneaked a hit between the Collinsville infielders, held them hitless for the remainder of the game with a 7th inning assist by Randy Rogers. 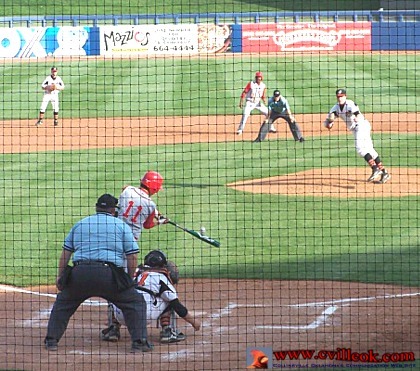 Jordan Musto was at bat in this first inning photo with Brent Werdel on 1st after a leadoff walk. 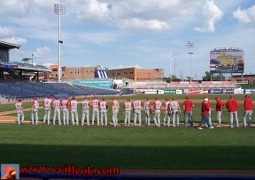 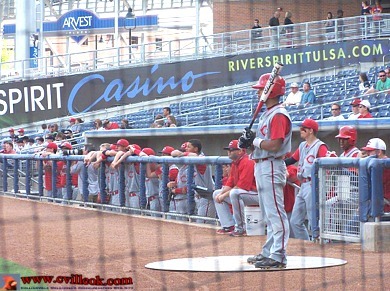 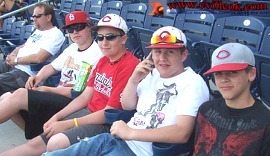 Jose Olazagasti in the on-deck circle and the rest of the Collinsville Cardinals in the Driller's visitor dugout. 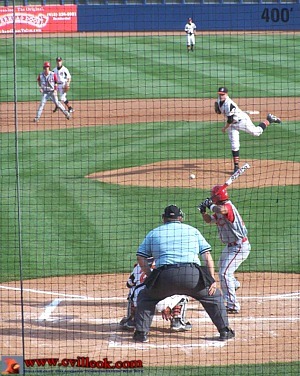 Peter Rodriguez at bat in the scoreless 1st inning. 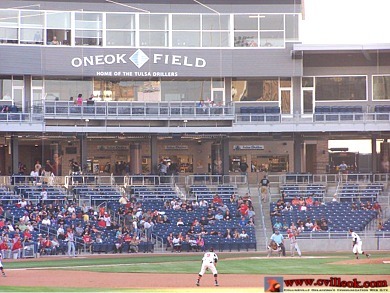 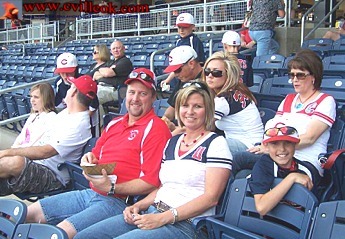 Collinsville had a nice sized crowd in Tulsa Thursday evening to support the CHS Cardinals and check out the new ballpark but they were overshawdowed by empty seats in the large structure until the early crowd for the Jenks-vs-Union (2nd) game started filling in. 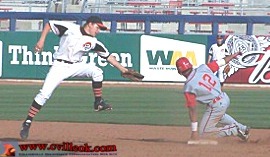 Jose Olazagasti reached 2nd base on this third inning play then later scored on Peter Rodriguez RBI single for the Cardinals 1st score. 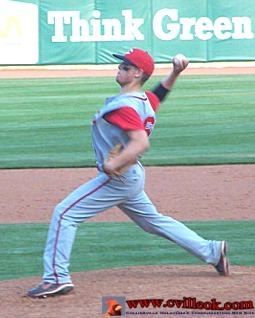 Kraig Kelley doubled in Peter Rodriguez in the 3rd for a 2-0 score. 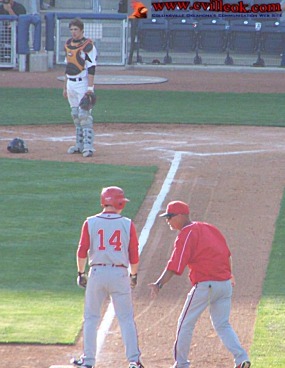 Nick Goza was congratulated by Coach Tony Reeder after driving in a run with a triple in the 6th inning for a 3-0 score. 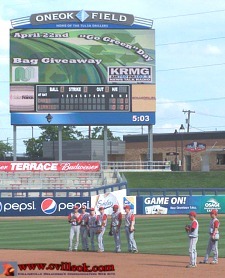 The Cardinals completed the inning up 6-0. 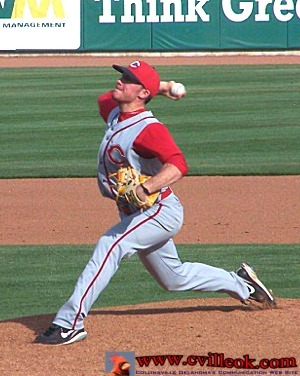 Randy Rogers pitched the final inning for the cards and perserved the shutout.